For over 3 decades, our team has garnered a reputation for responsiveness, professionalism, and getting results. 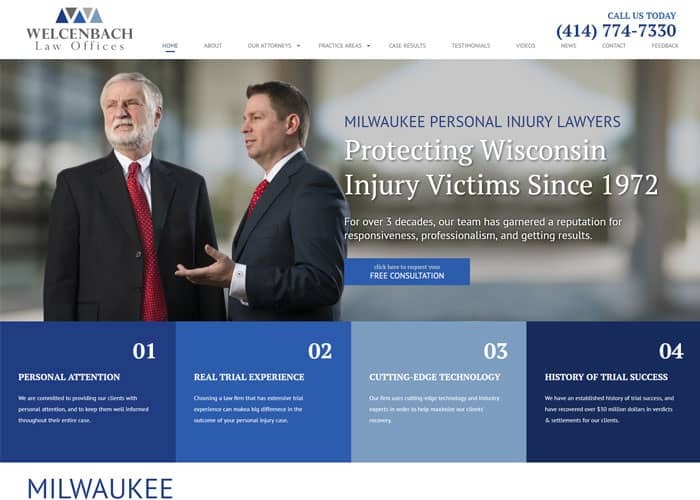 Welcenbach Law Offices is a Milwaukee-Waukesha based law firm with over 75 years of combined experience and a focus on estate, probate and trust litigation for those in the Wisconsin area. Our lawyers also have a strong background providing businesses and individuals with premium legal services in the areas of estate planning and business. The attorneys at our law firm offer clients a holistic approach by meeting their current needs, as well as their long-term goals. We handle estate and trust litigation such as Will Contests, Beneficiary Designation Disputes, Power of Attorney Mismanagement, and Trustee Liability, as well as advise clients on how to draft estate planning documents to avoid such challenges. Contact us today for a free consultation where we can discuss your needs. Do you have estate and probate litigation questions, such as whether or not a will is valid, that require the knowledge and skill of an experienced trial lawyer? Are you questioning whether a relative, guardian, executor, personal representative or trustee has breached their duty, mismanaged assets, or stolen assets? Or, do you need help starting or completing a probate in Wisconsin? Our estate and probate litigation attorneys in Milwaukee, Wisconsin routinely represent blood relatives, heirs, beneficiaries, creditors, personal representatives and trustees in all types of estate, probate and trust matters. Often times, estate and probate disputes involve other issues such as real estate, tax, business and insurance law. Our Milwaukee estate and probate lawsuit attorneys have extensive experience in all of these areas that make us one of the leading choices to help assist you in your matter. We have spoken to local, state and national groups in the areas of will contests, undue influence, beneficiary designation disputes and other elder law matters. At Welcenbach Law Offices, we offer specialized expertise in a variety or probate related disputes, combined with a team of attorneys experienced in civil litigation for personal injury disputes, workplace disputes, and will and trust negotiations. Whether you need help interpreting a will, replacing a vulnerable person’s conservator, facing a probate court battle, resolving property disputes, or managing the assets of a trust, we’re Milwaukee’s leading choice for estate, will and probate legal assistance. Our clients are our greatest, most trustworthy advocates! “Welcenbach took over a relatively simple estate distribution after two other firms tried, but failed to assist me getting it closed. By the time Welcenbach took it over, much time had gone by, and it had become relatively messy. Their team kept the government’s team away and kept the wheels turning until the estate could be successfully closed correctly without excess costs or fines. If a friend were having trouble with another firm, I would suggest Welcenbach. It would be better yet just to start with Welcenbach, and get it done right the first time!” John D.
“The will was handled very efficiently. Everyone we dealt with was knowledgeable & very helpful. Taking care of a will is very emotional, & they were very sympathetic & SO PROFESSIONAL.” Kathleen S.
No matter how simple or complex your probate or estate litigation case, we can help assist you. Fill out our online form to request a free consultation or contact us today for assistance.